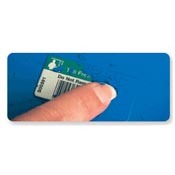 Label material, adhesive and construction need to be designed to meet your application requirements. BCA facilitates the above by working with major suppliers of blank and pre-printed labels that specialize in Industrial and Asset Control Applications. Materials; Mylar, Polyester, Anodized Aluminum, Metal and Tamper Proof. All images are imbedded in the base material and a protective overcoat is applied. If you need to paint over the labels more than once, then this permanent label has a special laminate that resists paint. Simply wipe it off. 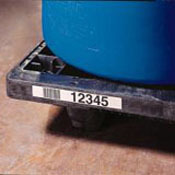 Track your pallets and / or products out the door. The adhesive is specially design for today' polypropylene pallets. They will not be able to be removed in one piece. A metal label that will withstand 1200 degree F. It is more affordable than our stainless steel label but it can still take the heat. Send us your application and we will hopefully provide a solution. Please view the label samples on the next page. Home | Laboratories | Libraries | Industrial | Contact Us Copyright © 2004-2012. Bar Code Applications Inc.